Pruitt will look to become the fifth straight Tennessee head coach to win his home opener in his inaugural season. The Vols are coming off a 40-14 loss to No. 17 West Virginia in the Belk College Kickoff last weekend in Charlotte. Tennessee’s 463 victories in Neyland Stadium rank second most all-time in any college football stadium, trailing only Georgia Tech’s 470 wins at Bobby Dodd Stadium. The Big orange have won 22 of their past 23 home openers, with the lone loss during that span coming in overtime to No. 19 Oklahoma in 2015. ETSU head coach Randy Sanders will make his return to Knoxville on Saturday afternoon. The first-year head coach for the Buccaneers played quarterback for the Vols from 1984-88 and was a member of the UT coaching staff in some capacity from 1989-2005, including serving as offensive coordinator during Tennessee’s 1998 BCS National Championship run. Sanders also coached on the same staff with Pruitt and current UT special teams coordinator/safeties coach Charles Kelly at Florida State in 2013 when the Seminoles went undefeated and claimed the final BCS National Championship. Tennessee enters Saturday’s contest having won 13 consecutive games against in-state non-conference foes. In fact, the Vols are 70-3-2 all-time against in-state schools in non-conference play. Saturday will mark UT’s first meeting with ETSU and third contest against an in-state FCS opponent since 2014. Sophomore running back Tim Jordan had a breakout performance in the Vols’ week one loss to West Virginia, rushing for a career-best 118 yards on 20 carries. Jordan added his first-career touchdown with a 4-yard scamper into the endzone in the third quarter. The Florida native is the first Tennessee player to rush for over 100 yards since fellow sophomore Ty Chandler accomplished the feat with 120 yards against Kentucky last season. Eight true freshmen made their Tennessee debuts in last Saturday’s season opener against West Virginia. Defensive backs Alontae Taylor and Trevon Flowers both started for the Vols, becoming the first UT true freshman defensive duo to start in a season opener since Curt Maggitt and A.J. Johnson did so against Montana in 2011. Flowers finished the game with five tackles and a pass breakup while Taylor recorded four stops and deflected a West Virginia punt in the first quarter. East Tennessee State University (ETSU ) is located in Johnson City, just a little over 100 miles east of Knoxville. The Bucs are in their fourth season of college after reviving the program in 2015 following a 12-year hiatus after disbanding the program in 2003 for financial reasons. Tennessee Director of Athletics Phillip Fulmer played an instrumental role in bringing football back to ETSU. While serving as a consultant for the university, he was prominently involved in the coaching search as well as fundraising for the program’s eventual return. The Buccaneers are led by former UT player and assistant coach Randy Sanders and are coming off a 28-7 win over Mars Hill last Saturday night in Sanders’ debut. ETSU returned six of its top eight tacklers from last year’s team that finished 4-7 and is led by Temple transfer Logan Marchi at quarterback. Marchi threw for 273 yards and three touchdowns in last week’s victory. 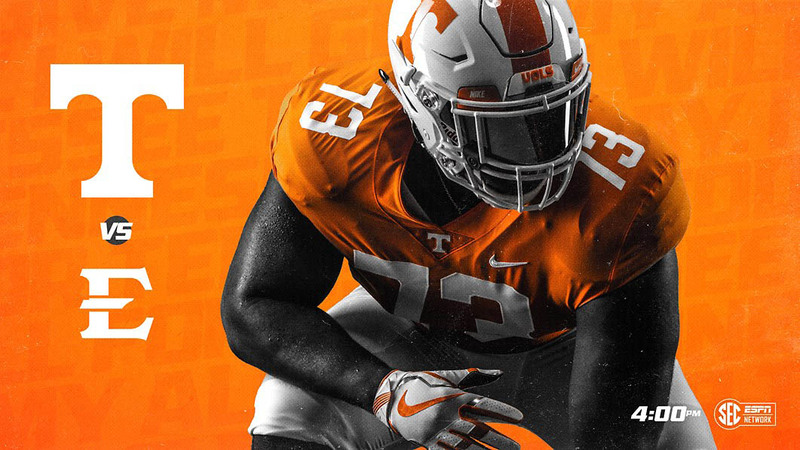 Tennessee will honor the late Reggie White as its Legend of the Game on Saturday afternoon. His widow, Sara White will be accompanied by VFLs Phil Stewart and Bruce Wilkerson during a pregame presentation to honor the former UT All-American and Pro Football Hall of Famer.